Run by the icons of Verona and see top spots like the Arena to discover the beautiful essence of its historical centre. 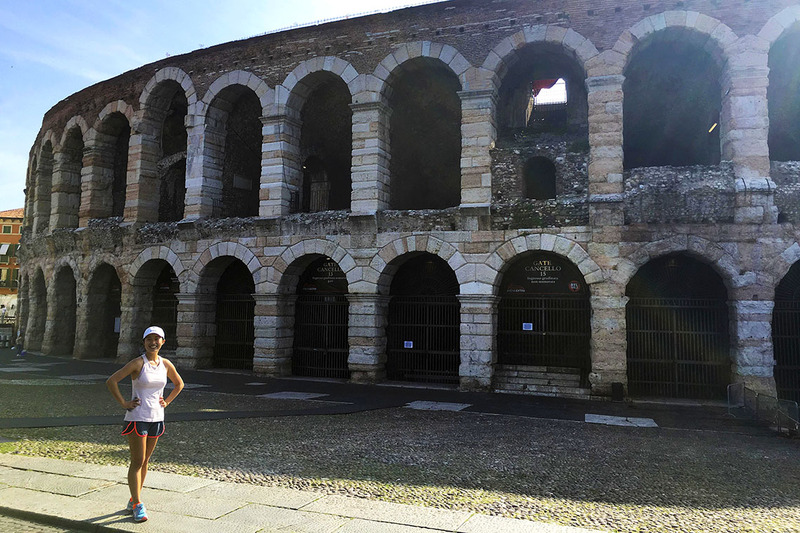 The Arena running tour will lead you around the historical city centre of Verona by run, in a no-crowd course to sightsee all the iconic places of the Roman and Medieval ages. Have a look on the both sides of the river Adige flowing into the city and learn from your guide about Verona’s past time to gain a great general introduction to the city. Start from Castelvecchio, the 14th century fortress, run along the frescoed palaces facing Piazza delle Erbe, cross the river Adige and pass by the Roman Theatre to overlook the city from a nice panoramic terrace. Keep running along the Adige course and pay a stop to Romeo and Juliet‘s balcony, run by the wonderful Arena in the shining early-morning light and go back to Castelvecchio where the tour finishes. DEPARTURE/RETURN LOCATION *Hotel/Apartment pick-up. If your accommodation is not located in the historical city centre of Verona the meeting point will be set in front of Castelvecchio. The running tours are exclusively led in external areas and it is not planned any entrance/access to museums, churches, galleries and similar.